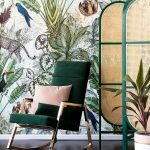 Interior designer Suzie Beirne from Maison Jardin was to create a link between the home’s existing media room and games room. 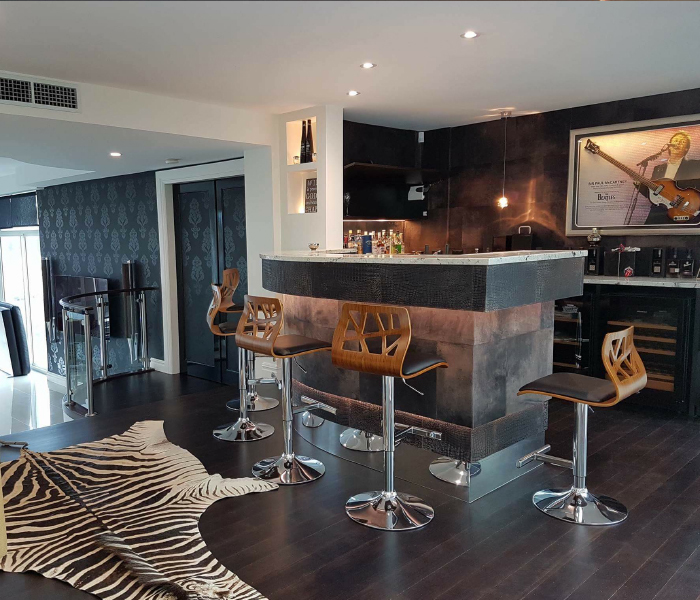 A fabulous curved bar was custom designed by Suzie to serve as a striking but functional focal point between the entertainment and living spaces. 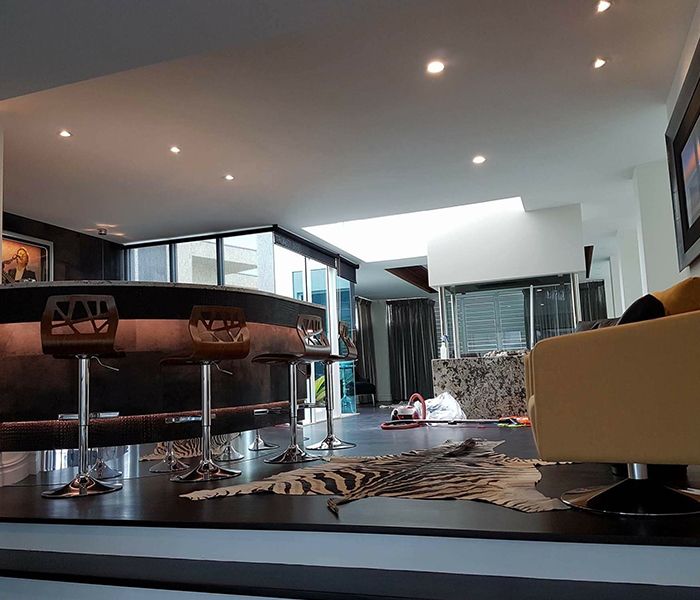 Suzie had worked on a previous project for the client, so when he and his new wife purchased a completely different residence for their new life together, they asked the interior designer to step in and help make the home better orientated for family life. 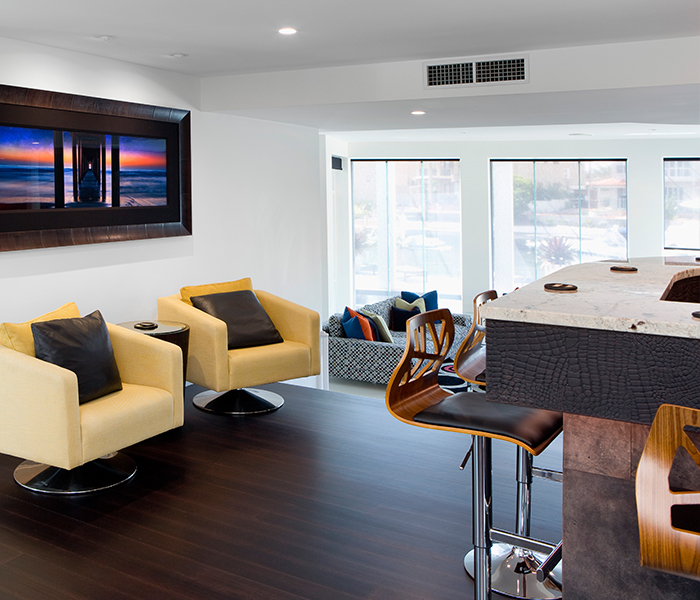 “The main challenge was to create a connection between the family room, media room and games room, which has its own island fireplace,” says Suzie. The solution was to install a fabulous and inviting bar. “This idea evoked many happy memories for the client who, as a child, enjoyed the congenial atmosphere of his parents’ bar when friends would come by to share many days and nights of laughter and fun.” Working with a central open area that lacked purpose, the designer enclosed the space, removing a large back window to create the rear wall of the bar. 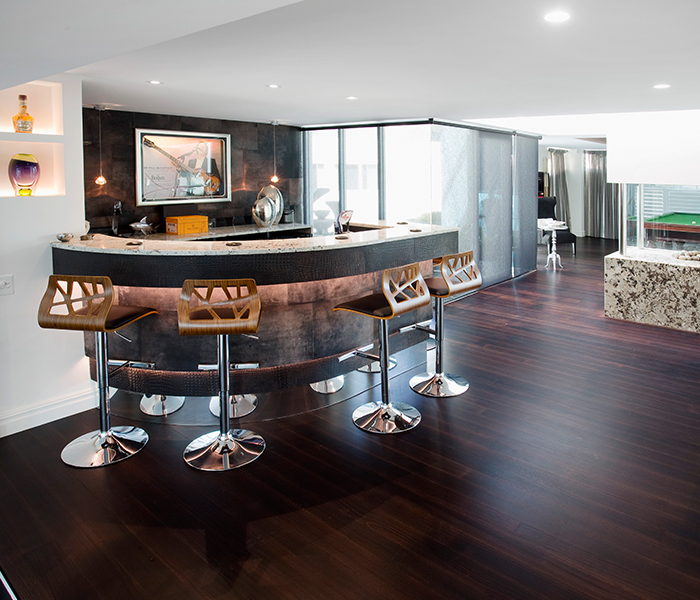 Suzie then gave the bar itself a gently curved shape to allow a more natural flow for guests moving between the games room and bar on one level and the media room, four steps down. 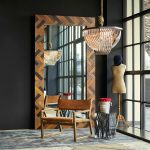 Ferroni leather tiles in a combination of faux alligator and suede finishes are a chic addition to the bar area, while vintage granite was chosen to match the free-standing fireplace stone and contrast with the stainless steel workbenches of the bar. Subtle LED lighting, both in front of and behind the bar, offers a selection of moods, from bright and functional to subtle and understated. High on the client’s wish list for the bar was a kegerator, wine fridges, ice maker, dishwasher and Zip Tap with hot, cold and aerated waters. 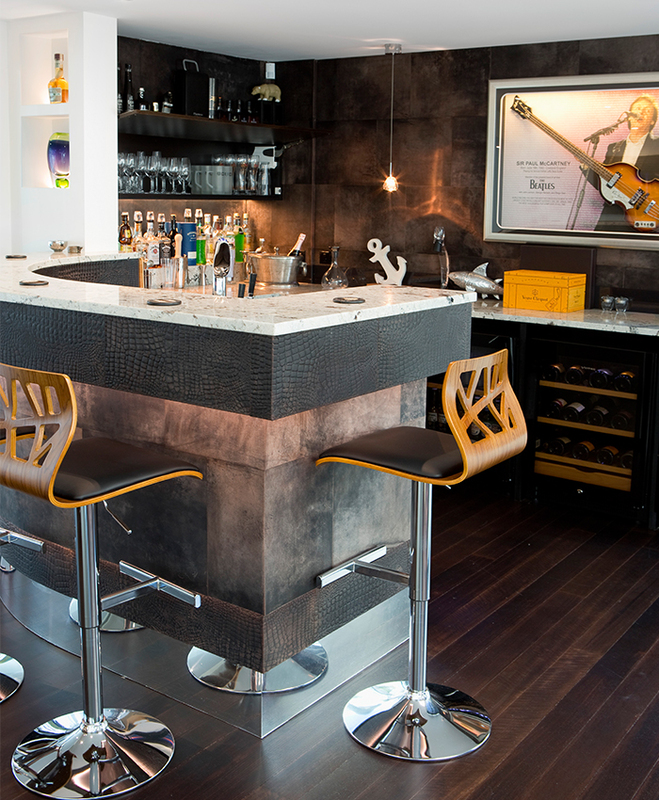 The client’s own collection of art and memorabilia takes pride of place, including a framed and backlit guitar that once belonged to Paul McCartney.The slick bar area is now a stylish and functional space, perfectly suited to entertaining friends and family. The original rich, vibrant colour scheme of ebony carved timbers, black, white and cream with a dash of curry spice was retained as the palette throughout the rest of the home. The main foyer was transformed to echo the rich, dark tones, with floors, banister rails and stairs all sanded back before a satin chocolate stain was applied. The lounge room was opened up by removing the existing sheer curtains and exposed tracks installed by the previous owners and replacing them with sheer blinds and shutters.